Item is a typed, carbon copy letter on onion skin paper from Thomas Dixon, Clerk of the Peace in Bruce County. The letter was most likely originally sent to a Canadian Pacific Railway (CPR) office in Bruce County and then copied and forwarded to other CPR stations, including the North Bay office. 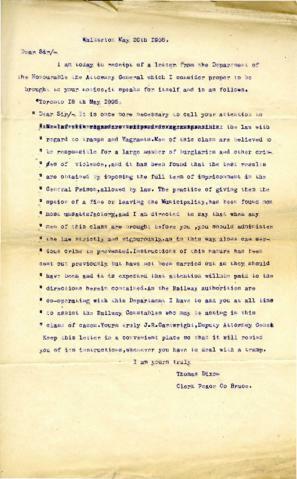 The letter quotes a letter Thomas Dixon received from the Attorney General on May 18, 1905 concerning homeless men in regards to burglaries and violent crimes. The letter instructs railway employees to assist the Railway Constables with handling these matters and to remind the constables of their duty to "administer the law strictly and vigorously." Thomas Dixon was born November 12, 1843 in Milton, Halton County, Ontario. He worked as a Barrister at Law in 1876 in Walkerton, Bruce County, Ontario (later as the Clerk of the Peace) and died August 1, 1929 at the age of 85.